What Are You Hungry For - Marci R.D. In our Western culture, pleasure and appetite is treated with judgment and scorn. Yet a little known fact is that the more frequently you honor your appetite by eating foods that are genuinely satisfying to you, the less obsessed you will feel about food. And the more likely you are to make balanced choices over time. 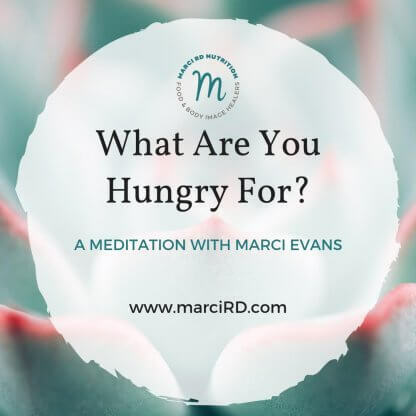 In this 10 minute meditation you will be introduced to one way of identifying what you are truly craving with encouragement to follow through and eat those foods with greater frequency. My hope is that with practice, your relationship to food begins to heal one pleasurable meal at a time. Feel free to share your story in the blog comments or on social media!